Diving on Sipadan was pioneered by Borneo Divers. Above the water, it’s just a tiny 40 acre spot of jungle with a white sandy beach. But below the water, Sipadan’s vertical topography and abundant marine life make it one of the world’s most desired destinations. Now Sipadan has entered a new age of conservation. Since January 1st 2005, all resorts have vacated the Island and it will become a fully protected conservation zone. Work is in progress to list Sipadan as a World Heritage Site by UNESCO. Borneo Divers is proud to support this conservation effort and is working with the Malaysian government to secure Sipadan’s future protection. Sipadan is famous for its wall diving. Walls surround 90% of the island, and most are sheer drops that extend out of sight into the blue depths. Many of the walls have ledges that the turtles use as resting places. Some of the walls are so steep that they are actually undercut and slope inward toward the island creating overhangs encrusted with soft corals. Between dives, you can soak up some sun on the powdery white sand of the private beach in front of the resort, or relax by the newly constructed pool. The fleet of fast modern speedboats ensure that whether you are going to one of the macro sites surrounding Mabul, or to the famous dive sites of nearby Sipadan, your transportation will be fast safe and comfortable. Borneo Divers Mabul Dive Resort occupies a beautiful stretch of white sandy beach. Easy access to the water provides for effortless shore and boat diving. Originally designed to be a second base of operations in the region to complement our Sipadan Resort, with the new conservation project in progress, BDMR has been promoted to our flagship operation and base for diving both Sipadan and Mabul. BDMR was built with divers needs in mind. Every detail is laid out to make your stay memorable. 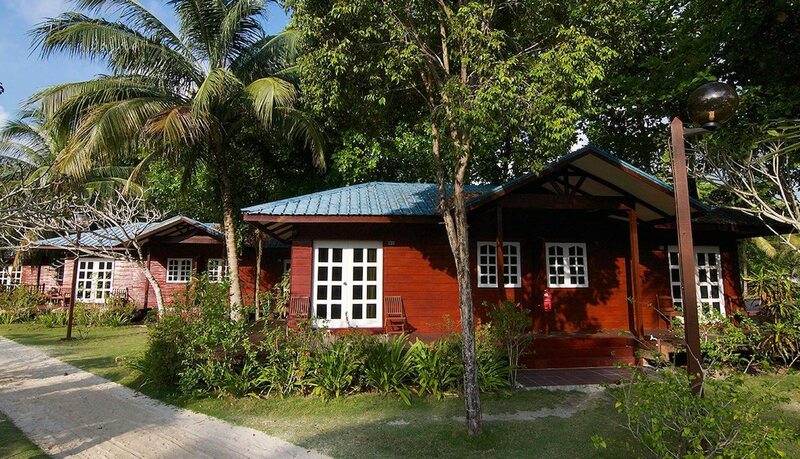 Accommodations are provided in attractive and comfortable chalets, all with a view of the beach and the Borneo Mainland in the distance. All units have either twin or double size beds. Private ensuite bathrooms provide modern hot showers and toilet facilities. Amenities such as hair dryers and reading lamps are available in all rooms. Each room has a comfortable sofa for relaxing with your favourite book.